DEVELOP & STRENGTHEN FINE MOTOR SKILLS - To string and place the beads properly on the string, the eyes and hand have to coordinate together, strengthening your child's visual perception, and motor coordination in a fun and enjoyable way. Great for all kids, and a constructive toy for special needs and autism too! JUMBO BEADS FOR EASY GRIP, MANEUVERING and SAFETY - The large 1.5 inch size colored & different shaped beads helps make it easy for your toddler, preschooler or child to easily grasp the pieces, and hold the grip while lacing it through the Strings. In addition, the holes, to string the beads, are big enough to make the stringing and lacing simpler and child friendly. SHAPES -COLORS-PATTERNS- Set includes 36 PLASTIC beads, of 7 different colors & 6 different shapes with 4 strings. It'll allow your preschooler child to develop any kind of patterns, stringing the different colors and shapes together, while learning and grasping the colors and shapes in the process. HOURS OF FUN AND ENTERTAINMENT-LET THE CREATIVITY SOAR - Have your child develop their creativity while stringing, lacing, and creating different designs with The 7 different color beads and 6 different shapes. TOTE BAG INCLUDED FOR EASY CLEANUP & TRAVEL - No worries, about missing beads. With the included bright colored tote bag, cleanup will take 1-2-3, while ensuring that no pieces go go missing, once your child is done playing... In addition, you can easily take it along, wherever you go! 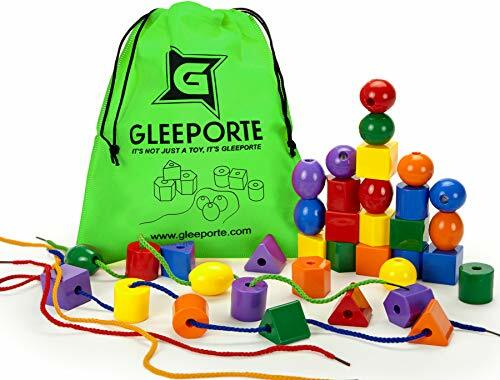 If you have any questions about this product by GLEEPORTE, contact us by completing and submitting the form below. If you are looking for a specif part number, please include it with your message.